Interested in going on that long distance cruise to Hawaii? How about seasonal cruising at 10 knots up to Maine for a summer vacation? Anyone up for a non-stop delivery from Corpus Christi to Key West? Or what about a liveaboard home that lets you go off in style during your weekends, yet has the capability to go transAtlantic in a couple of years when you finally break free? Any of these strike your fancy? Have I got a boat for you! P.A.E.’s new 50-footer delivers all of the above, and more, in a contemporary design that embodies everything that has worked for them in the past, as well as a number of new design elements that are destined to be improvements to the breed of voyaging powerboats.As you probably know, P.A.E. took the passagemaking business by storm back in 1989 when they launched the first NORDHAVN 46. Having offered the delightful line of Mason sailboats for a number of years, the people at Pacific Asian Enterprises saw the need for an honest-to-goodness power voyager—so they developed the highly successful NORDHAVN 46. In the years since the first hull splashed, almost 60 of these capable cruising boats have been delivered, and their cruising record is truly impressive. The Sink’s circumnavigation (whose story was presented in our Premier Issue) is testimony enough to the strength of this design, but they were not an isolated case—a number of N46s have been out there enjoying the good life. And now, with the growing number of people wanting to spend quality time offshore, we figure the N46 will continue to enjoy a long production run. The N46 is almost the definition of a niche boat—loved by those who appreciate its offshore capability, embracing the design compromises made in the interest of true seakeeping ability. Those who don’t understand the boat find it small and slow for a 46-foot powerboat, and some even find it a bit too salty looking. Imagine that! P.A.E.’s Jim Leishman told us the N46 came off a clean sheet of paper, but follows their love affair with a certain look—notice the short waterlines and long overhangs of the N46 and all of P.A.E.’s Mason sailboats. Timeless and classic. And from the outset, the N46 was built around a goal for ultimate efficiency and seakeeping ability. The development of the NORDHAVN 62 was a next logical step, providing owners with a larger boat with more accommodations and yet still able to offer world cruising in comfort and safety. We all know that the powerboat cruising market spans a broader range of parameters than simply offshore safety and hull efficiency, as witnessed by the significant diversity in cruising boats. A Grand Banks is different from a Krogen is different from a NORDHAVN is different from a…you get the idea. Different strokes for different folks. The new NORDHAVN 50 was originally conceived as a 47-foot replacement for the N46, but that idea was rather short-lived. Jim Leishman, Joe Meglan, Dan Streech, Dave Harlow, and the rest of the crew have talked to literally hundreds of people who have come to see their boats, getting a great deal of input about what people fancy in accommodations, styling, and performance. You see, for a lot of people, certain tradeoffs can be justified regarding the elements of a proper cruising boat. P.A.E. wanted to make this new boat fit a wider range of owner interests, without touching the secure position of the N46 as a fine seaboat—albeit smaller and slower than some other 46-foot boats—but one hell of an honest-to-God ocean crossing voyager. So they gave the design team, headed up by naval architect Jeff Leishman, some broader design requirements—and the 47-foot design evolved in stages up to 50 feet, becoming a completely different vessel than the N46. In its final form, the N50 has a look similar to the also-new NORDHAVN57, and both are true, full displacement passagemakers. Yet they look more contemporary, have much more interior room, and have performance characteristics that will appeal to people who appreciate the concept of a full displacement cruising boat—but not just ‘round-the-world cruisers who love the N46. These new boats represent an evolution in P.A.E. thinking based on years of experience. And both boats were extensively tank tested before production started. Let’s take a look at some of the elements of the N50 design. The stern sections were greatly increased compared to either the N46 or N62, actually more in keeping with the semi-displacement crowd. The design team agreed early-on that ultimate efficiency was a proper tradeoff for better accommodations and onboard space. From their discussion with so many people, they knew that going from 3 GPH to 4 GPH was not a major concern for most people, as long as it did not affect range or capability—and the added volume allowed the vessel to carry more fuel. Tank testing confirmed the reduction in hull efficiency due to the fuller stern, but not so much as to change anyone’s mind about accepting the greater interior space. The testing (conducted by B.C. Research in Vancouver, Canada) also highlighted some other benefits of the wider stern sections. For one thing, the new hull shape increased pitch resistance. When tested along with the bulbous bow, a 20% reduction in pitch was measured—certainly a desirable characteristic for any cruising boat! Testing also showed that the dynamic lift created by the wider stern allows a higher boat speed—not exactly planing speed, but a solid 10 knots with the proper propulsion. And this is in a full displacement boat with a 44-foot waterline that can cross oceans! When cruising up and down the coast in the N50, you could elect to run at 10 knots, burning 8 GPH—accepting that for this application, range is less important than getting into port before dark, while there is still time to get a table at that popular lobster house. Add to the equation that slowing the single engine down to a loafing 1,400 rpm gives a nice passagemaking speed of 8 knots—all the way across the Atlantic or out from Hawaii to points south, using 3 GPH with enough range for 3,100 nautical miles. This adds up to one very flexible boat—which definitely opens up your possible horizons! Another unusual design factor that helped increase boat speed was actually created for a very different purpose. These days, people want an engine room in their vessel, and standing headroom is definitely the ticket. To accommodate this without increasing draft or sacrificing the desired saloon and cockpit configuration, Jim and Jeff created some bulges in the hull down by the keel (at the garboard strake for you wooden boat fans). Next time you fly, notice how modern commercial aircraft sport similar blisters on their fuselage midsection for landing gear and fuel. Jim calls them maintenance strakes, they are now in the process of patenting these design elements. They were initially tank tested on a model of the N57, and everyone agreed beforehand that a loss of efficiency of up to 5% would be acceptable if standing headroom in the engine room was achieved. Jim Leishman told us the engineers at B.C. Research weren’t exactly enthusiastic about the bulges, but agreed to measure their impact on the model hull. After the first run down the tank, the engineers got quiet, and they did the run again, and then a third time. The engineers then came over to the P.A.E. group and said, you’re not going to believe this, but the bulges actually reduce resistance by 2.5%! The maintenance strakes apparently affect trim, flattening out the running angle of the boat. On the N50 and N57 hulls, these maintenance strakes have proven to help increase boat speed, and both boats also benefit from much-appreciated headroom in the Holy Place. A real win-win situation. We toured the first NORDHAVN50 in Dana Point, California, P.A.E.’s main office. Everyone there was quite excited about this new addition to the successful line of NORDHAVNs. As you’ll see, the boat is all they hoped it would be, performing even better than expected. Even if you never plan to cross an ocean, there is something here to check out. A full displacement cruising boat with flexibility. The first thing I noticed walking down to the boat was the apparent height. With the pilothouse this far forward, the bow and superstructure seem to tower over you standing on the dock. This is really more of an illusion, as the bow is only 7-1/2 feet from the water. But viewed from anywhere forward of the bow, the boat looks serious, almost menacing. And with a huge, slotted stainless steel stemplate just under the bow rollers to protect the hull, the impression is almost that of a knight in battle armor, ready to do battle for God and country. A voyaging Sir Galahad. This strong forward profile eases as you move aft, with large windows inboard of the high bulwarks. Also noticed is an almost total lack of exterior brightwork on the NORDHAVN 50. In fact, the only teak on the entire exterior is the caprail along the top of the stern transom. We were told that improvements in the building process allow a much tighter fit of the hull and deck pieces, so the traditional teak caprail is deemed unnecessary. The result is a very low-maintenance boat, since all the hardware, handholds, and fittings are stainless steel. The 6-inch wide bulwarks have stainless steel trim to protect the boat alongside pilings and docks, and a lower rubrail extends about 25 feet along each side of the hull. Solid protection indeed. On each side of the boat, there is a 20-inch wide door in the bulwarks about 14 feet forward of the stern. These panels swing open for entry onboard, so you don’t have to climb over anything. Very civilized. The full width stern, with integral swim platform, also has a door built into the transom. So it is easy to get on and off the boat, and handling gear or groceries will be quite painless. The side decks are well protected, with 37-inch high bulwarks keeping you onboard, and there are plenty of stainless steel handholds located around the exterior of the boat. The decks are 14 inches wide at your feet, and 18 inches wide at the caprail. There is 6&apos;6" headroom walking around the side decks beneath the protection of the upper boat deck. It’s four steps up to the bridge deck, which is also well protected. Hull No. 1 has the symmetrical layout configuration, so there are side decks port and starboard. Provision was made in the molds to allow for an asymmetrical “widebody” layout similar to the N46, where the saloon extends full-width on the port side of the hull. On the bridgedeck, decks are 18 inches wide down at your feet and the bulwarks are 40 inches high, so shooting starsights or looking at the horizon can be done from this comfortable and protected location. A full-width Portuguese bridge wraps around the front of the pilothouse and bridgedeck, and there are good-sized storage lockers built into it. Two round portholes in the side of the bridge open into each of the two guest cabins. Outboard on both sides of the Portuguese bridge are wing control stations, with bow thruster, depth sounder, engine throttle, steering and horn controls. Managing this boat from either of these wing stations will be wonderful when transiting locks or tight maneuvering situations when it is best to be outside for better visibility or communicating with those ashore. Very nice, and there is a similar control station on the aft deck, installed in a locker with a sink and chest of drawers. Standing behind the Portuguese bridge, you are only about ten feet to the bow. On the issue of seaworthiness, some would think it not a good idea to have the pilothouse so far forward, considering rough going into nasty head seas. Jim Leishman told us they have taken that into account, and, while the pilothouse has forward-sloping windows with windshield wipers, they increased the thickness of the glass from 10 mm to 12 mm. For a long offshore passage, Jim recommends putting the 1/2-inch acrylic storm plates on all exterior windows. All windows have screw fittings for just that purpose. While on the subject, Jim also mentioned that although the N46 may continue slogging upswell longer than the N50 before having to slow down, the new 50-footer will have a more comfortable motion due to the bulb and stern sections of the hull. Overall the N50 will be more seakindly, but with comparable seaworthiness to the N46. A door in the Portuguese bridge leads up to the foredeck, which is surrounded by a 33-inch high stainless steel railing and a 9-inch bulwark up to the bow rollers. A Maxwell 3500 vertical windlass eases anchoring duties, and there are wash-down facilities located within reach. Two large scuppers drain water off the foredeck, and there are two dorade vents and a large lockable storage locker just forward of the Portuguese bridge. A 22-inch square hatch opens into the forward guest head shower, and shorepower cords plug into a protected locker on the portside of the foredeck. Back aft at the stern, the aft deck is a reasonably-sized gathering spot for lounging, fishing, or socializing under way or at anchor. The overhead boat deck extends 2 feet over this aft cockpit area, which is 14 feet wide and about 6 feet long. Lockers in the transom store the two 20 lb. LPG tanks, dock lines, and even a wash-down faucet. The four diesel fill intakes are mounted on the sloping outboard side of the transom, two on each side. This should prove very convenient, as the intakes can be accessed from both the aft deck or swim platform, at waist or chest level—so no more kneeling in contorted agony while waiting for the seemingly endless routine of filling fuel tanks. Thanks from all of us older deckhands! There is a huge 31" by 42" lazarette hatch in the center of the aft deck. The hatch is dampened, which will keep it from cracking around the hinges from banging shut. The wider stern section of the boat make this lazarette enormous, and a perfect place for batteries, watermaker, air conditioning, and any other equipment that needs to be stored, but preferably out of the hot engine room. There is also easy access to the rudder post and steering gear, and you can just make out the top of the tunnel built into this hull to allow spinning a bigger propeller. (More on that later.) A small access door leads into the engine room from the lazarette. Two funky-looking grills mounted on the sides of the cabin on the aft deck are actually air intakes for the engine room. They are relatively large (16" high), providing unrestricted air flow into the Holy Place. Under way, surprisingly little engine noise came out of these grills, which is good for those enjoying the sights from the aft cockpit. For some reason, these grills remind me of the late 1950s—no idea why. A vertical stainless steel ladder is the normal way up to the 15&apos; long by 14&apos; wide boat deck, although the assymetrical widebody layout includes a user-friendly set of steps from just outside the pilothouse. As with all decking on the boat, diamond-shaped molded nonskid provides sure footing, although teak decks are optional. The boat deck is ringed with a 29" high stainless steel railing, with more than enough room for a big dinghy and a couple of kayaks. The forward end of the boat deck butts up to the rear of the pilothouse, which has a large fixed 29" by 13" window for rear visibility over the boat deck. All NORDHAVNs use dry exhaust systems, so the various vents and pipes are located here, as well as a mast and dinghy-handling boom. A locking sliding door separates the aft deck from the interior of the saloon. Stepping through the 35-inch wide doorway, you enter a saloon similar in general layout to other boats because it works—no magic here. A curved L-shaped settee with adjustable table is on the port side, and even without the assymetrical configuration, there is plenty of room for a couple of stuffed chairs and small table on the starboard side opposite the settee. The visibility out from the saloon is excellent, with three large windows on each side of the saloon and four of them can be opened. In keeping with the offshore capability of the boat, however, the glass in these windows is 10 mm thick, and all have storm plates. Another large window is on the aft bulkhead behind the settee. The counter between the galley and saloon extends out enough for a couple of swivel chairs—making a cozy eating nook when you are just serving cappuccino and croissants instead of a sit-down dinner. It goes without saying that P.A.E. can accommodate some alternative interior changes, especially in terms of building a custom entertainment center or dedicated liquor cabinet. The galley on the NORDHAVN is a traditional U-shaped affair, with a Corian (or equivalent) counter over 6 feet long. The counter surfaces are 36 inches high off the tiled sole, and twin stainless steel sinks are mounted diagonally across the counter for galley duties—giving the cook real counterspace on both sides of the sinks. Nice. The boat has a non-gimballed three-burner Force 10 LPG stove, with a GEmicrowave oven mounted over top of the stove. The galley is also equipped with a trash compactor, and refrigerator and separate freezer, and a massive pantry bin. Other N50s will no doubt have their inventory of preferred galley equipment. There is another engine room hatch (24" by 22") in the cabin sole just off the galley sole tile. Stepping up into the pilothouse, it is clear this is a totally different boat from the N46. The pilothouse front windows are 12 feet from the bow, and it feels as if you can almost touch the front of the boat from the pilothouse. Visibility from the helm is outstanding, except for a small blindspot over the starboard rear quarter. Besides the two doors to the bridgedeck, there are opening windows on both sides of the house. All other forward and rear-facing windows are fixed. The pilothouse is almost 10&apos;6" wide, which allows a full-width navigation and helm station, with angled surfaces for the normal complement of electronics. Spiral stairs on one side of the house lead below to the forward guest cabins. The owners’ stateroom is located amidships beneath the pilothouse. Similar in layout to the N46, the spacious cabin has a 5-foot wide master berth in an athwartships position. This has worked well in the N46, as it has proven to offer the best motion in a seaway. The cabin is finished in an ivory laminate that complements the teak and spruce sole and teak trim. As throughout the boat, headroom is 6&apos;6". Overall, the atmosphere in this cabin is light and airy, despite its below-decks location. There are several opening ports, and both spot and recessed lighting reflect enough off the light colors to keep the cabin pleasantly bright. Hanging lockers and positive-latching drawers flank both sides of the berth, which has additional storage underneath the mattress. A 48" high by 18" wide engine room door is fitted into one of the cabin’s bulkheads. There is a 7-inch round window in the door to allow visual inspection of the machinery space without always having to open the door itself. Both the door and bulkhead are well sound-proofed, as the noise in the master cabin is quite low while under way at cruising speed. The master head is on the starboard side of the stateroom. This head compartment, with its separate shower with integral seat, is finished in Formica and vinyl tile with Corian-type counters. It should be easy to keep everything clean, and the absence of teak and other dark trim lends a decidedly modern touch. While I don’t care much for the chrome and glass ultra-modern styling in some motoryacht interiors, here is an instance where a similar contemporary finish makes a lot of sense. There are numerous toiletry drawers, all with positive-latching hardware, for every conceivable head-related item. A single opening port provides added ventilation to this well-proportioned interior space, sized for real people. The owners of Hull No. 1 chose a layout with two guest staterooms forward of the owners’ cabin. A bulkhead separates the two cabins, each with privacy doors, and both cabins are furnished with two single bunks for guests and crew. While a bit tight in terms of living space, P.A.E. did a good job fitting additional berthing for four in a space I would normally associate with a single guest cabin. Two opening ports are found in each cabin, and the teak and spruce woodwork is superb. Not a bad place, really, to relax and read a book while off watch. Especially given the pleasant motion and sound of gurgling water rushing past the hull this far forward. The two guest cabins share a single head, located in the bow. The guest head is well designed, as it is a complete head facility in a limited area of the boat’s interior. A large shower compartment is centerline just aft of the chain locker, and the rest of the head compartment flows around the available space. The separate shower has a large tinted hatch opening up on the foredeck, which should be greatly appreciated at anchor in warm weather—I have a heavenly image of a hot, lingering shower with the sun shining in, and a gentle, warm breeze and the smell of lush tropical flowers. Take me there, NOW! Entry into the engine room is via the door in the master stateroom, or from a smaller door back in the lazarette. Turn on the light switches to illuminate the engine room space; several things come into view immediately. First, the overall impression is that of a simple and modern engine room, as the abundance of hoses, valves, and plumbing that seem to make engine rooms tight and claustrophobic have been craftily concealed. The single diesel engine sits with space on all four sides, even though it is straddled by two of the four fuel tanks. Actually, the distance between these tanks is a full 7 feet, so there is more than enough elbow room. The maintenance strakes are plainly visibly—or rather, the benefits of them. The curve of the hull is easy to follow, and it isn’t difficult to see just how much room they add. Were it not for these strakes, no way could you easily walk around this engine. Overhead are the four large removable panels for serious engine maintenance, but all regular checks and minor service can be done without lifting a thing. Thanks to the maintenance strakes and overall design, there is a full 5&apos;1"–5&apos;2" of headroom in this Holy Place. The port side has slightly less headroom due to the Fernstrum Gridcooler (the keel cooler used on the N50) recessed into the hull at that location. All fuel sight gauges are recessed, with cleverly installed lighting to aid inspection of the current state of the fuel supply, which totals 1,320 gallons among the four tanks. Small lift-up panels reveal the fuel transfer pump, manifold, values and plumbing, and the Racor fuel system filters are easy to check and maintain. The design team originally planned to use the Lugger 668 engine in the NORDHAVN50, since it has been used with great success in the N46. As a result of the higher speed potential measured in tank testing, however, it was decided to look for a more appropriate engine. They eventually selected the turbocharged-aftercooled Lugger L108A, which is based on a Komatsu industrial engine block. A good combination of computer-aided design and newer technology, with old industrial engine features such as wet cylinder liners, valve rotators, and all the things that make it a heavy duty engine. For this particular application, Lugger derated the L108A to 250 hp at 2,300 rpm. Using a ZF gearbox and 3:1 reduction gear, the engine is a good balance between slow speed operation for long passages, as well as providing 10 knot boat speed without undue stress. In an effort to reduce propeller cavitation and associated onboard noise, P.A.E. decided to fit a bigger propeller to the boat, turning at a slower rpm—the key to quiet vessel operation. Initial sea trials are showing the success of this approach, and when the final pitch adjustments are complete, everyone agrees the results will be a quieter, more efficient boat. The Lugger L108A is equipped with both a 24VDC alternator, as well as a 12VDC Prestolite 130Ah alternator. Hull No.1 also has a Northern Lights 12.5 kW genset. The boat has P.A.E.’s recommended wing engine—a Yanmar 3GM30F with V-drive and Martec folding prop. Overall, I think this engine room is as uncluttered as is possible for a boat with this capability. It seems like a good place to spend quality time maintaining all machinery. This is always an easier proposition when the engine room is spacious and there is enough headroom. Really a nice setup, and I congratulate Jeff and Jim for coming up with the maintenance strake idea. The strakes really work, even forgetting the positive changes in trim. Cruising along off Dana Point, with the normal Pacific Ocean swells, we got a chance to see how well all this comes together in the 50-footer. Obviously, a true test will be a voyage to some distant port, with a variety of weather and sea conditions, to test the mettle of P.A.E.’s new NORDHAVN. Even so, the boat feels good under way, even though it was a brand new boat that hadn’t been fully commissioned, but we could still see the impacts of the design changes that went into the N50. Noise levels, for example. While there was not even a swatch of carpeting aboard, or shelfload of books to help isolate and contain noise aboard, the sound levels were quite comfortable in all speed ranges. Taking into account a needing-to-be-adjusted whine from the newly installed Naiad stabilizer gyro, a being-tested central heating system pumping large quantities of warm air throughout the boat, we still measured sound levels that indicate this will be a quiet and comfortable cruising yacht. When engine room noise measured at 99–100 dB, closing the access door in the master stateroom quieted the stateroom noise level down to a much-quieter 70 dB—and it will be no doubt quieter with the other factors filtered out. At the passagemaking speed of 8 knots at 1,450 rpm, guest cabin noise levels were in the 64–65 dB range. Moving around the boat showed similar promise, and I’m sure the completed and fully-found vessel will be a successfully quiet cruising home for its new owners. The boat handles easily and positively. The combination of bulb, long full keel, and large rudder kept the hull on track without undue motion or effort. The boat is stabilized with Naiad’s active fin system. Quite impressive. Switching the fin system off for a moment, and the hull starts to instantly wallow and roll. Flip the switch back on, and just as instantly the motion is rock-solid. Pacific swells are no match for a properly stabilized vessel. As for the higher speed potential of the boat, we saw it run comfortably at 10 knots, and it felt good to see the boat so well behaved at both passagemaking speed…and beyond. Jim Leishman summed up their enthusiasm. “We couldn’t possibly be more pleased with the performance of this boat.” The people at P.A.E. are still conducting sea trials with this new addition to theirstable of voyaging motorboats, measuring actual performance with calculations from computer modeling and tank testing—but it is clear they have found the sweet spot with this hull. The NORDHAVN 57 will soon arrive in Dana Point, and everyone is looking forward to that boat as well. Now that you’ve seen the new NORDHAVN 50, a question for you…does it make more sense to have one boat for all your cruising interests, or should you evolve through a number of boats as your cruising agenda changes? 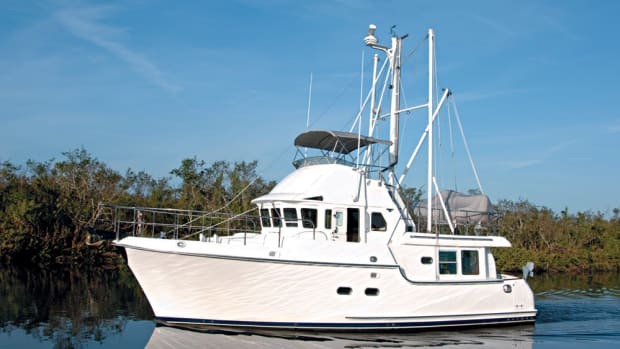 Certainly, there are many boats that fit the needs of the coastal cruising community, and there are many alternatives for a cruising liveaboard home should that be your raison d’etre. And when the time for true bluewater passages looms near, yet again you have a choice among the current crop of voyaging powerboats. But what if you could do it all with one boat, just one big investment step that could follow you and yours in your journeys—no matter how changeable your mood or spirit. Would you actually realize the “this is my last boat” sentiment? The potential is certainly there, and with the help of computers and technology, we shall continue to see design limits pushed. Not to stay content with what has always been, but to propel the vision ahead. Although I’m a traditional type by nature, I’m excited by the new and the different.